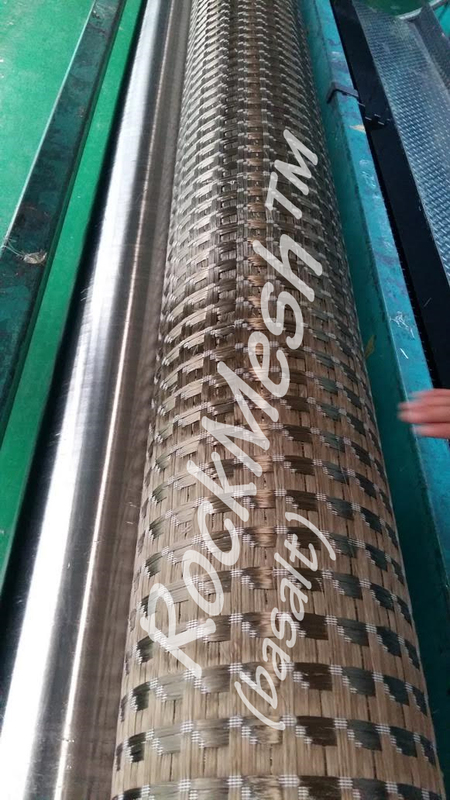 & RockMesh®﻿﻿ multiple patent pending. 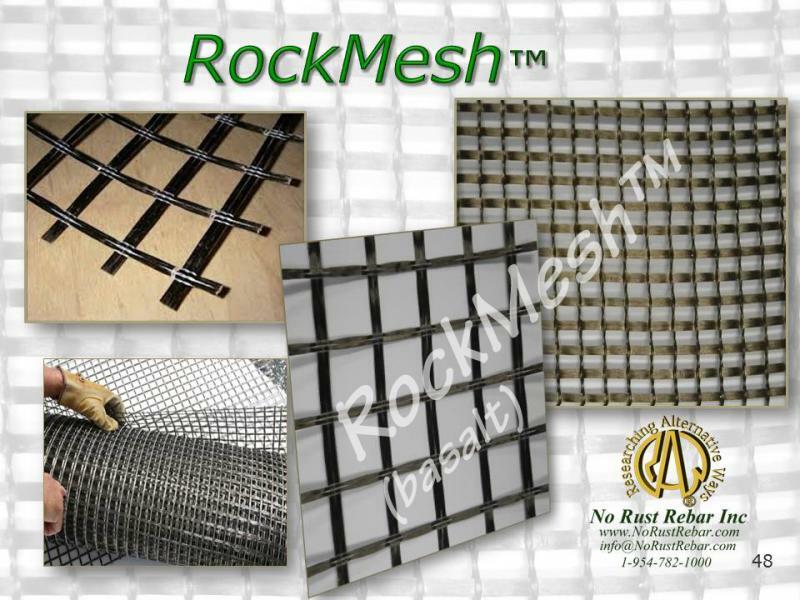 RockMesh® has several uses in civil engineering. 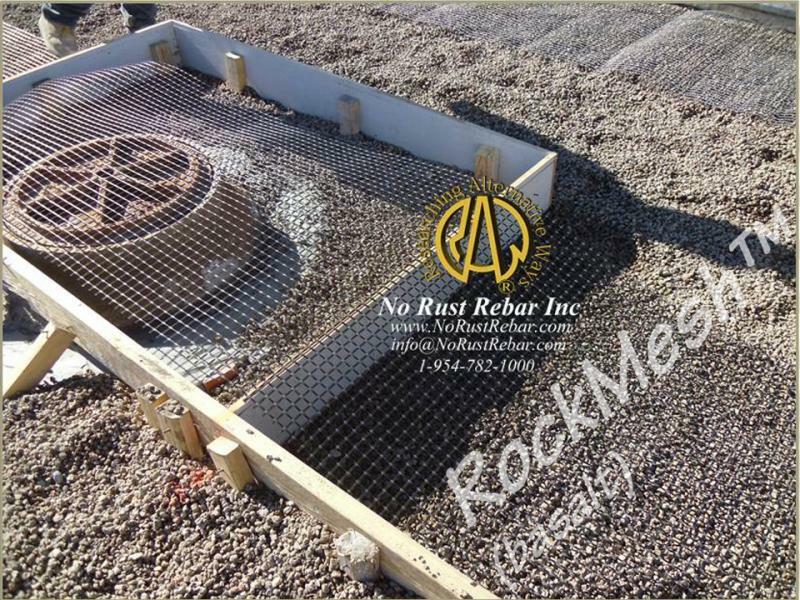 The aggregate of the roadbed should be stabilized by 1-1/2”x1-1/2” RockMesh® rather than rusty steel. 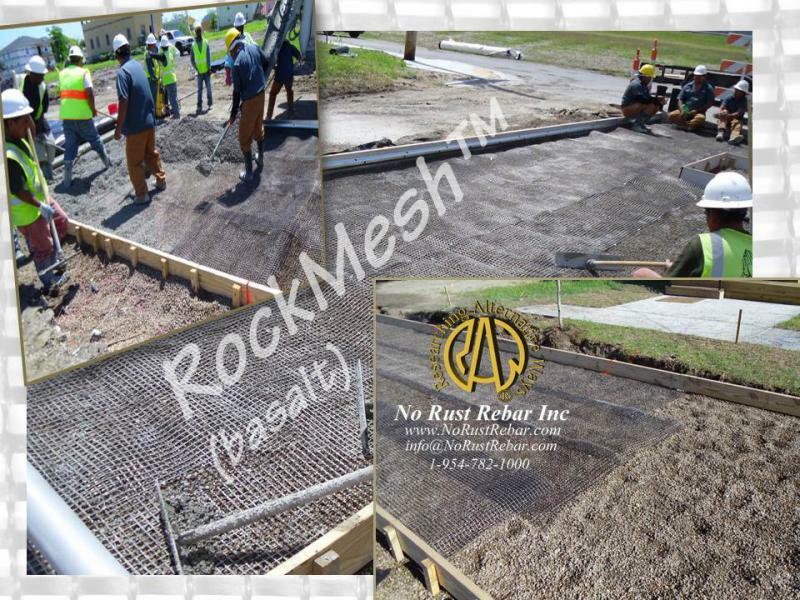 RockMesh® is state of the art for the structural reinforcement of Pervious concrete. Pervious Concrete is 20-25% open to allow standing water to pass right through and a sustainable alternative to standard concrete in that it reduces stormwater runoff and improves water quality. 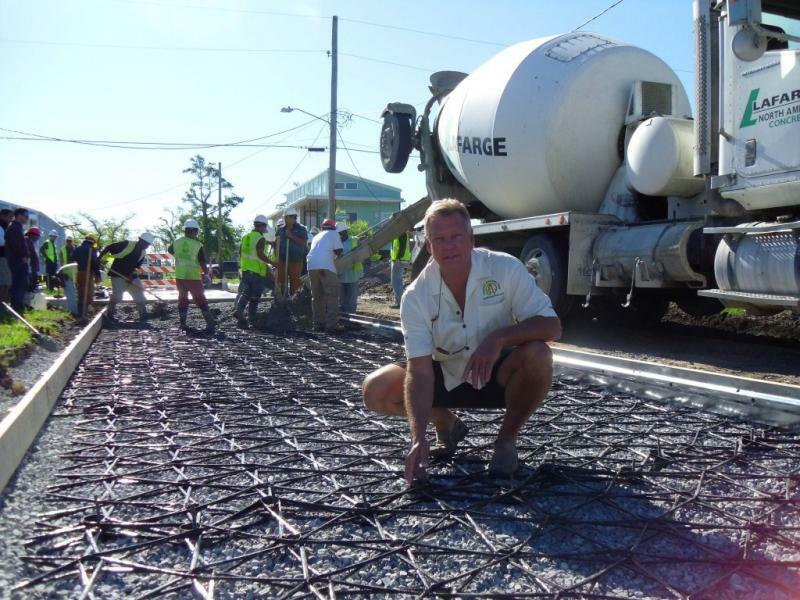 The application of pervious concrete helps municipalities meet requirements of the Clean Water Act as well as helping to achieve the United States Green Building Council’s LEED [Leadership in Energy & Environmental Design] status for new construction. The system allows for storm water to be managed onsite via retention and detention devices and only engaging the drainage system when those become full. After a rainfall event, the stored runoff will either evaporate from storage or infiltrate into the ground, helping the client save millions of dollars in pumping and environmental impact fees. 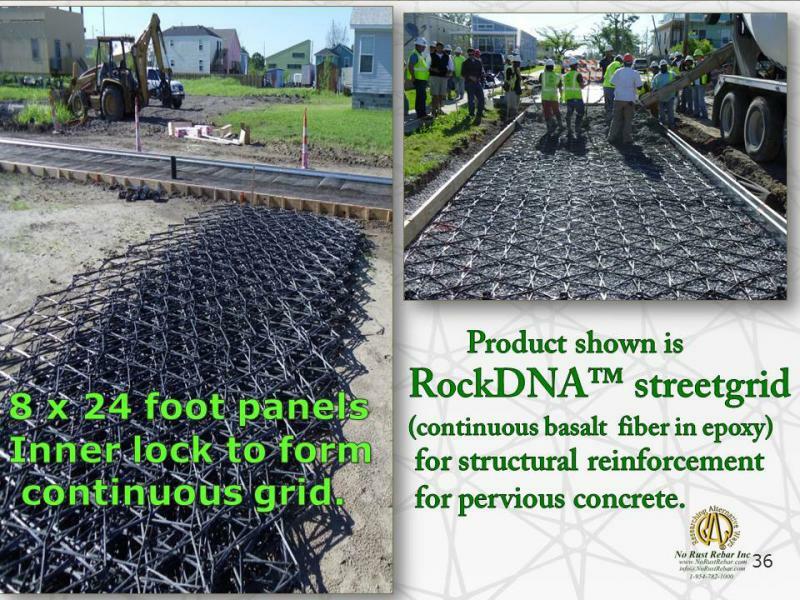 Our RockRebar®﻿,﻿ RockMesh®﻿﻿ and new RockDNA®﻿﻿ “Street Grid” were recently implemented into the residential streets of New Orleans 9th ward. 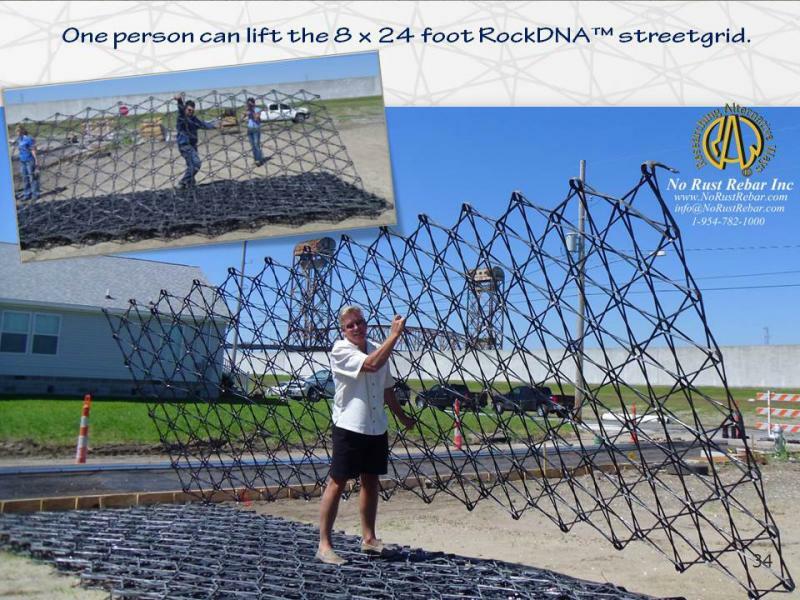 The adjacent photos show 8’ x24’ RockDNA®﻿ street grid as one man lifts it into position to span from curb to the street center in one panel! 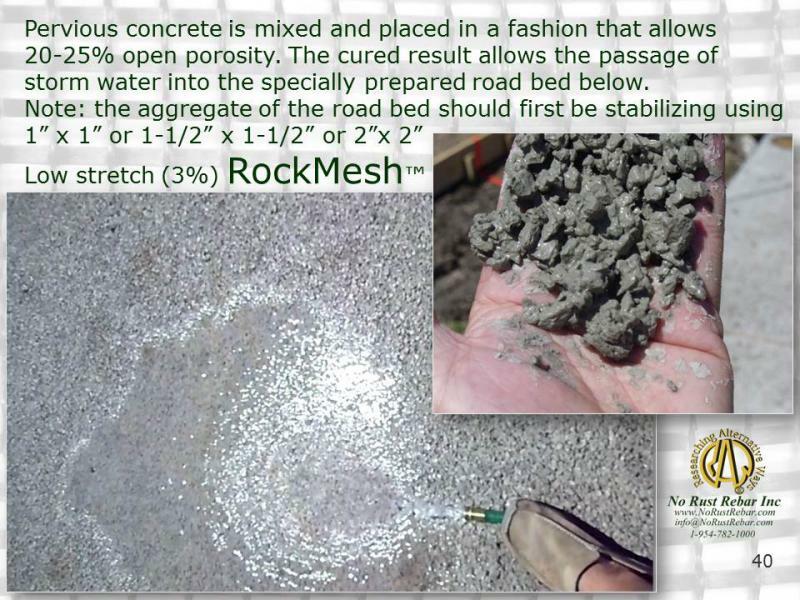 RockDNA®﻿ is positioned low within the pour of pervious concrete to provide sufficient tensile strength to allow pervious concrete to be used in structural applications such as a roadway that must stand up to concentrated and cycle loading of car and truck traffic for 100 year plus service life.Pervious concrete is mixed and placed in a fashion that allows 20-25% open porosity. 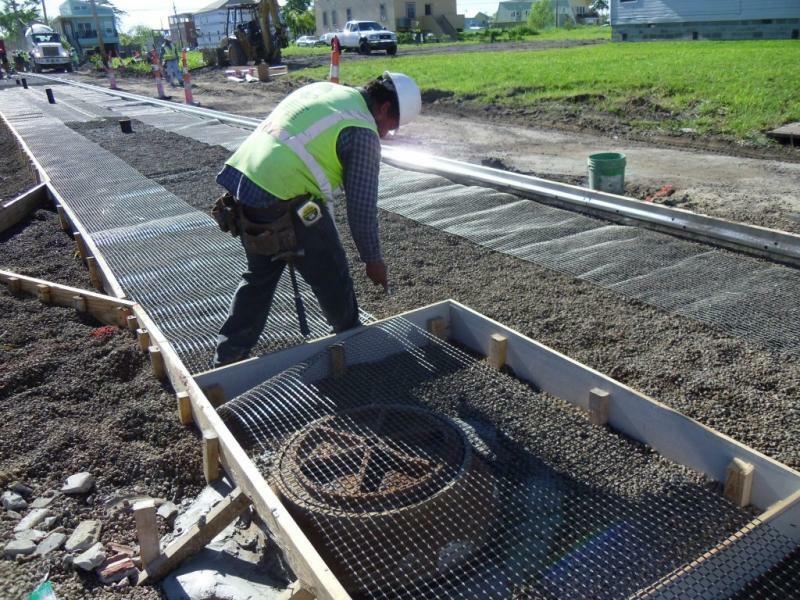 The cured result allows the passage of storm water into the specially prepared road bed below. 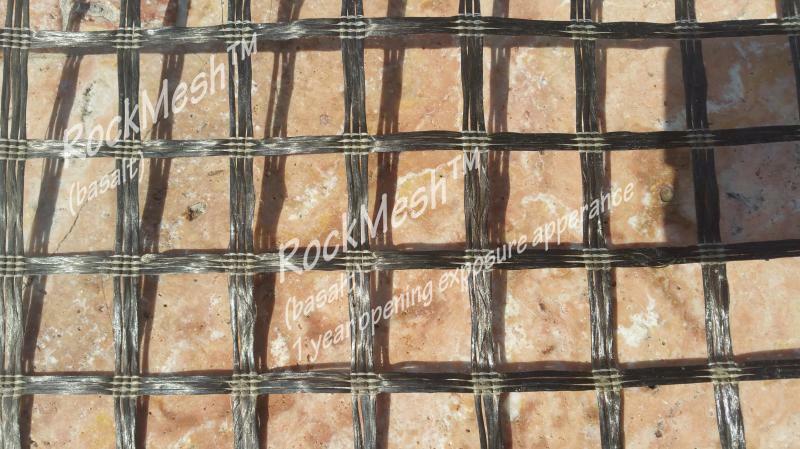 The aggregate of the road bed should be stabilized by 1”x1” RockMesh®﻿. Pervious concrete is a sustainable alternative to standard concrete in that it reduces storm water runoff and improves water quality. 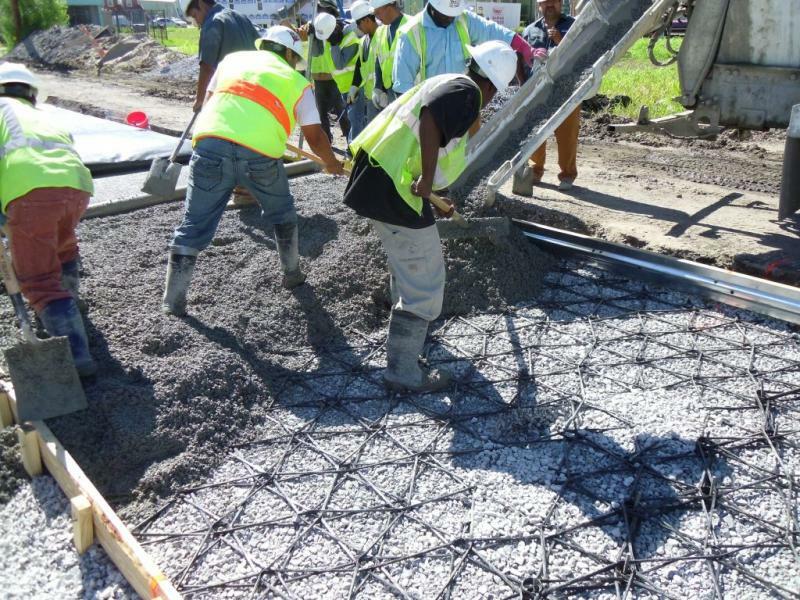 The application of pervious concrete helps municipalities meet requirements of the Clean Water Act as well as helping to achieve the United States Green Building Council’s LEED [Leadership in Energy & Environmental Design] status for new construction. The system allows for storm water to be managed onsite via retention and detention devices and only engaging the drainage system when those become full. After a rainfall event, the stored runoff will either evaporate from storage or infiltrate into the ground, helping the client save millions of dollars in pumping and environmental impact fees. 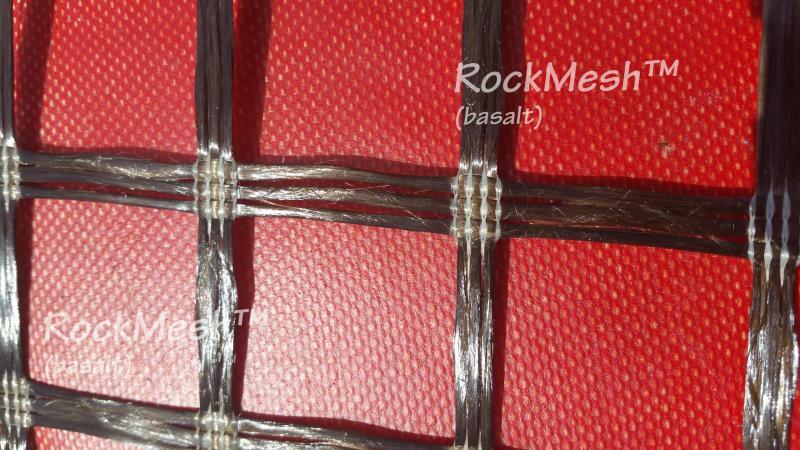 RockDNA®﻿ “Street Grid” is produced from the same continuous basalt fibers and adhesive matrix as RockRebar®﻿. 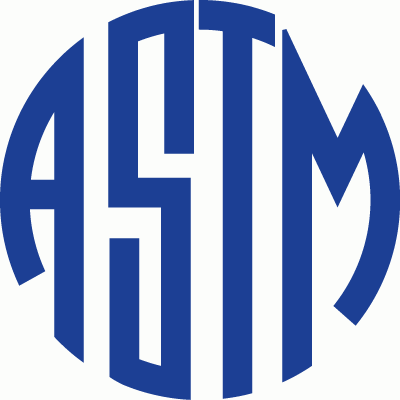 Aside from the obvious advantages of a high strength reinforcement that is 1/5th the weight of rusty steel. 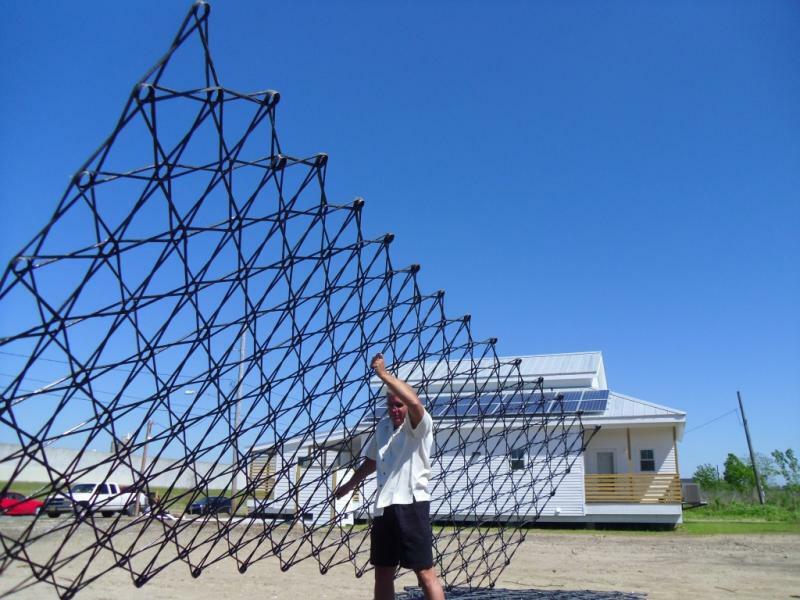 RockDNA®﻿ “Street Grid” can be placed in large sections up to 92" x 54' without the need for machinery! 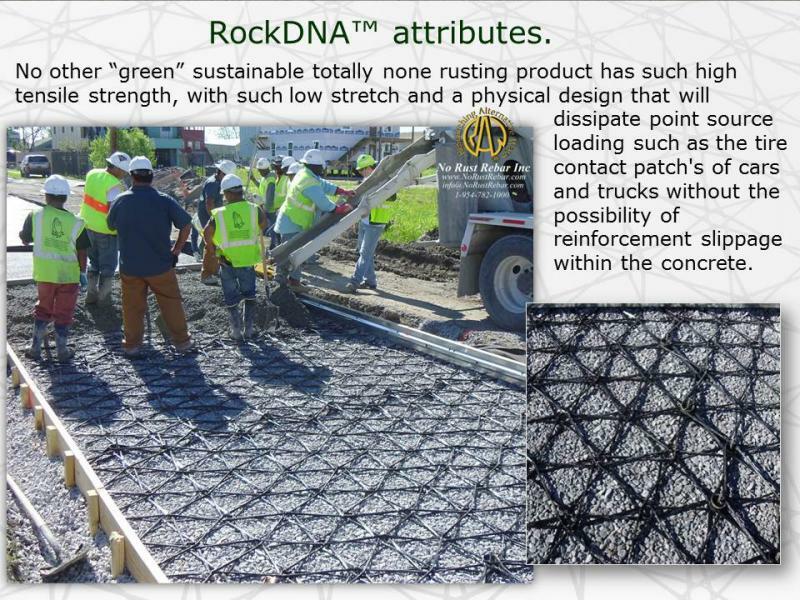 RockDNA®﻿ features several other patent and pending attributes. 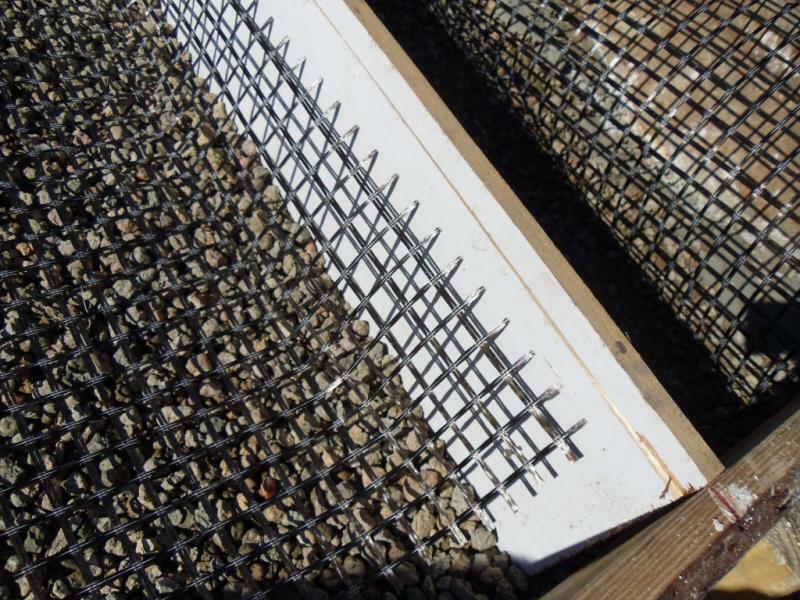 No other green sustainable product has as high a tensile strength and a physical design that will dissipate point source loading such as the contact patch where the load of car is applied to the concrete without the possibility of reinforcement slippage within the concrete. Please consider in the case of water passing pervious concrete it would be unwise to implement steel reinforcement to handle the bending moment the weight of a car induces within street. The very nature of pervious concrete having 20-25% open area makes it all but imposable to protect steel reinforcement from rusting. 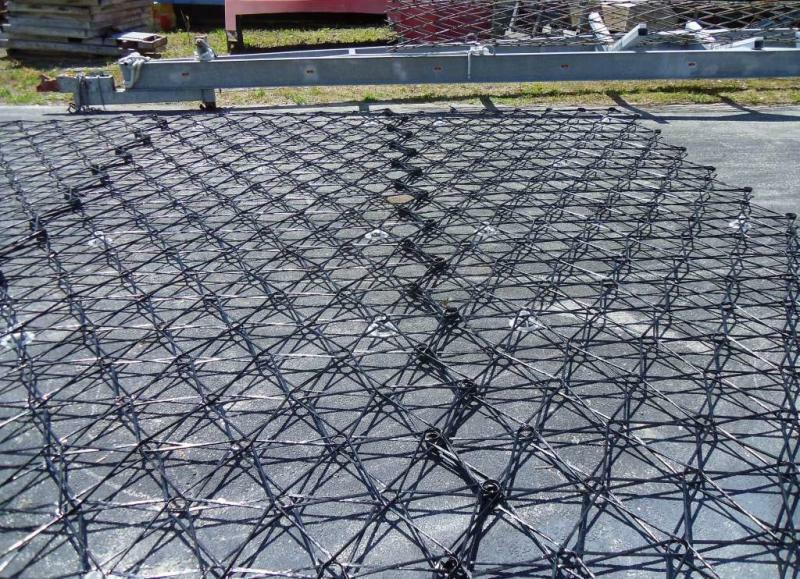 Additionally any reinforcement rod, even one with surface deformations such as with steel concrete reinforcing re bar or even our own RockRebar®﻿ with its spiral bulges designed to prevent the onset on slip will ultimately slip well before tensile failure in high load within pervious concrete simply because the water passing voids reduce the concretes bond area with the re bar. 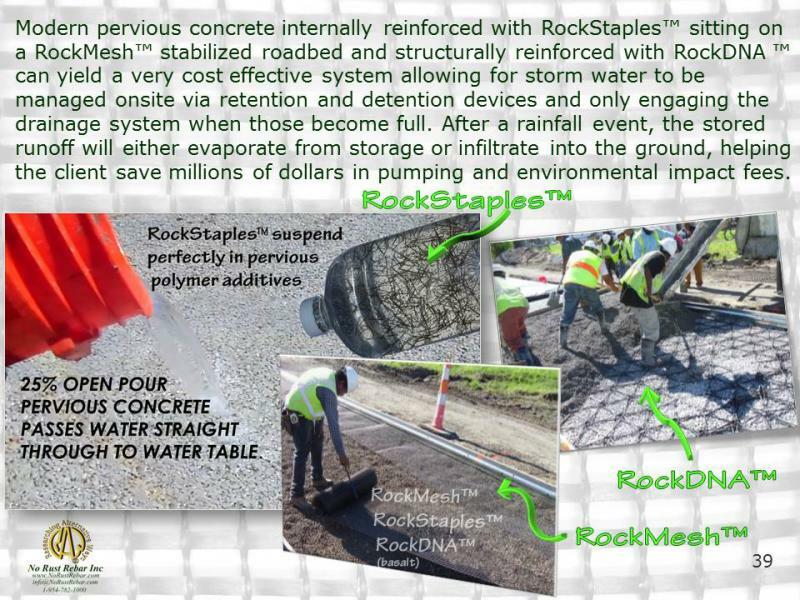 The patent pending invention of RockDNA®﻿ is its stretched figure (SHOW DNA)8 (DNA) that mechanically encapsulates the concrete or pervious concrete or even plastics to provide mechanical locking. 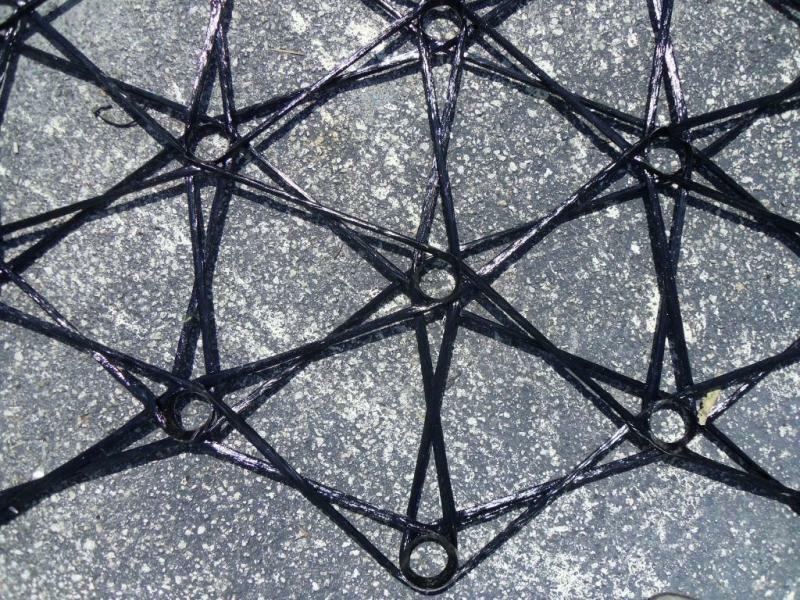 In structural applications physically encompassing the matrix to be supported with RockDNA®﻿ and its mechanical locking is required as opposed to relying on adhesive bond and or poor mechanical attachment with insufficient contact area. 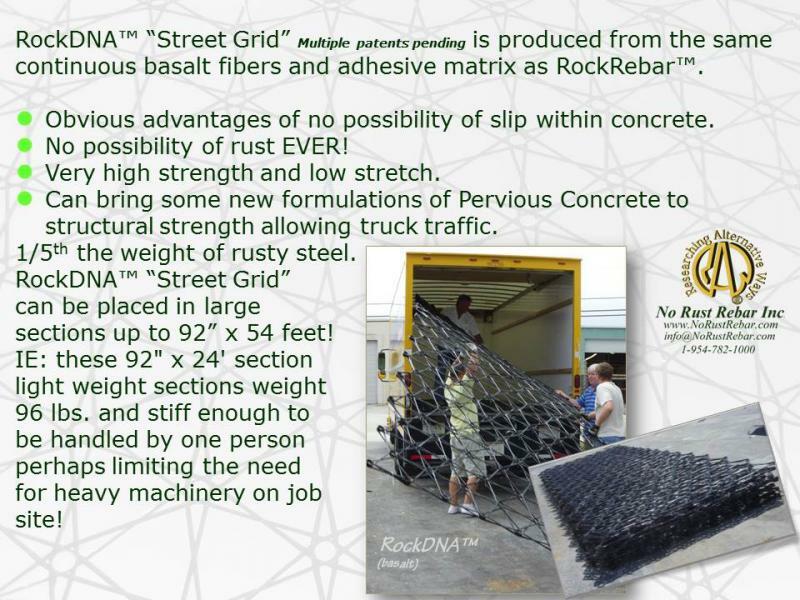 The inherently low stretch and the tenacious nature of the continuous basalt fibers used to produce the RockDNA®﻿ profile as a “Street Grid” are optimum to transfer and dissipate tensile, compressive and shear loads laterally through multi axes to the boundaries of the slab thereby spreading loads into the road bed over a much larger area of load bearing.